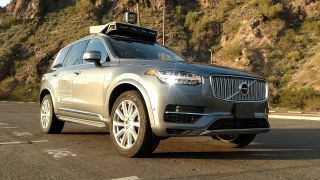 Following a fatal accident in Tempe, Arizona, Uber has suspended all self-driving tests on public roads across North America. At around 10pm PT on Sunday, March 18, an Uber self-driving car in autonomous mode struck a pedestrian walking outside of a crosswalk. A human operator was behind the wheel but not in control during the incident. The woman was taken to a local hospital, where she passed away from her injuries. In response, Uber has suspended all self-driving tests in Tempe, as well as in San Francisco, Pittsburgh and Toronto, the New York Times reports. Uber CEO Dara Khosrowshahi also expressed sadness following today's events. While Tempe police investigate, the US National Transportation Safety Board will also send an investigative team to Arizona, Bloomberg reports. The NTSB previously investigated the fatal 2016 Tesla Autopilot crash in Florida to determine if the automaker was at fault. The agency eventually determined that the Tesla driver's "inattention due to overreliance on vehicle automation" was partially responsible for the crash, and recommended that all self-driving cars have a method to alert the human operator when their focus on the road is "lacking". While we don't know the full details of the Uber fatality, today's tragic news marks an unfortunate first for the industry. No other deaths involving a self-driving car with the AI in control have ever been reported. This is also the first known fatality of a pedestrian struck by a self-driving vehicle. We will update this post when we receive a more detailed account of the accident.